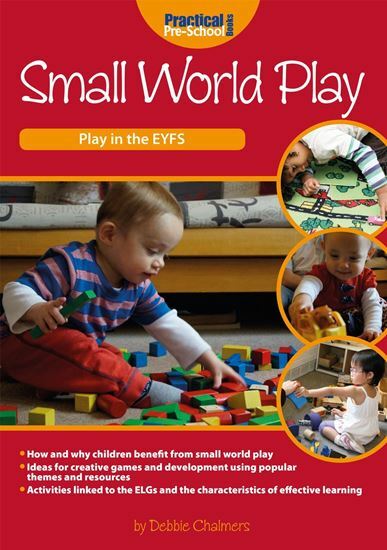 Small World Play is a practical and informative book for practitioners and home-based professionals to use in their daily work with young children at all ability levels. It is designed to show how small world play contributes to the EYFS curriculum and to other important areas of children’s lives. Explaining exactly what small world play is and why it is so important to all areas of children’s development, it describes the different types of small world play, with toys, models, puzzles, construction kits and recycled materials, how to introduce children to small world play and how to encourage children to apply thinking skills more confidently. • Recycled and found materials. Chapters are packed with ideas for resources, scenarios and narratives, to enable practitioners and children to share constructive and absorbing play, making this book a valuable guide to developing essential life skills, along with creativity and imagination. Debbie Chalmers has worked as an early years and drama practitioner and consultant for more than thirty years and is a writer of textbooks and professional articles for early years and primary education. Debbie is based in Cambridge.